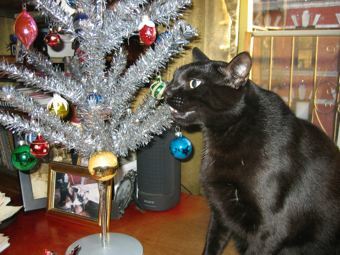 As you can see, Finney is foregoing ornament destroyage and going straight for the branches. Here he is, chomping on a branch. Chomp, chomp, chomp. Well, you can’t kill it evil little fur-dude, because IT NEVER LIVED. I was going to write this morning, but Howard so nicely downloaded some music for me (which I love) but the CD got stuck in my Powerbook (I think because of spilled orange juice a few days ago) and I have to go to the Apple Store to get it fixed. Then caroling in gorgeous, gorgeous Brooklyn Heights with some friends. So, ah, no work today, I don’t think!